What’s cool about cool roofs? In early July we endured four consecutive days of 90+ degree temperatures here in Bellevue, Washington, near Seattle. Nothing to complain about by comparison to the summer heat recorded on the East Coast and in the Midwest, it is true, yet it was a reminder of last year’s record-setting heat wave in our region, and it sent quite a few homeowners scurrying for air-conditioning solutions, whatever the costs and whatever the carbon consequences. Meanwhile the temperature in my house hovered benignly in the low 70s, topping out at 75. I barely even had to flip on a fan. I did so once, in a moment of weakness, while baking a potato in the oven. 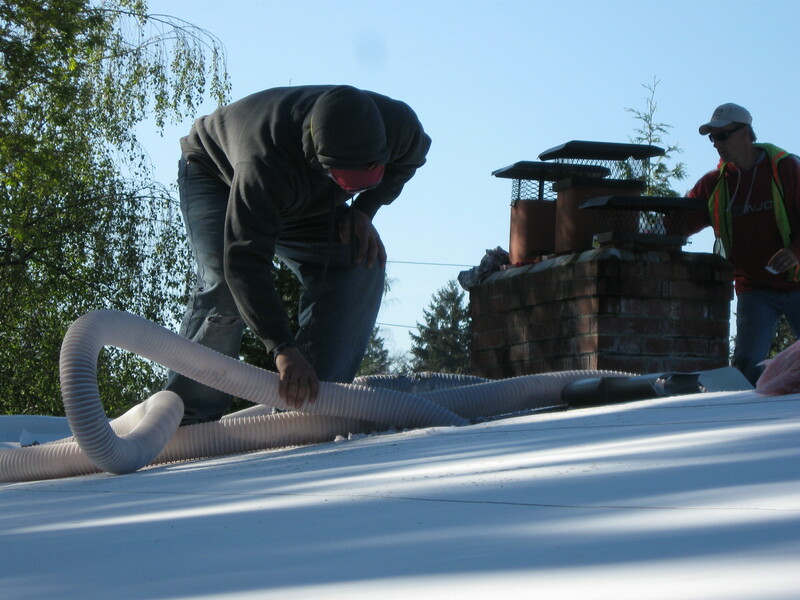 It was the first true test of the “cool roof” I had installed on my house in May. In this article, I’ll walk you through the process of selecting a cool roof, and why I think it’s a good investment, even in a relatively cool, northern latitude such as the Pacific Northwest. Cool roofs are white or light colored membranes that reflect heat away from the interior. Older homes here don’t have air conditioning, nor even do many of the newer ones. The theory goes that you’re only going to have 2-3 weeks a summer of uncomfortably hot temperatures here, so you outsmart it by drawing shades during the day (particularly on south-facing windows), picking out that sweet spot in the evening to open up windows and let the cooler night air indoors, turning on fans in the most popular rooms of the house, wearing shorts and t-shirts, and drinking lots of water. And that did indeed do the trick the first few summers I spent in my 1957-built home. At least for me. 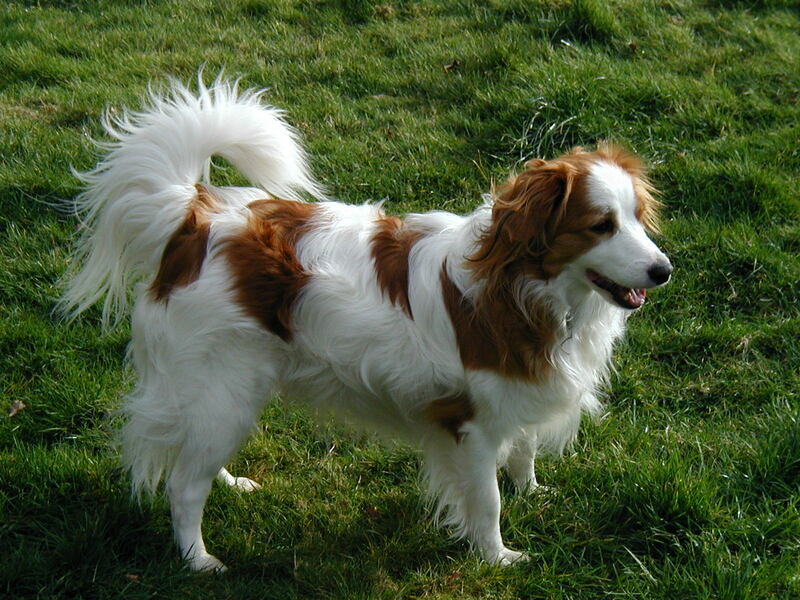 My thickly-coated, panting dog told a different story, especially weekdays when I’d come home from a day in the air-conditioned office, and he’d have spent the day baking in the warm, stuffy air of the sealed-up house. The thick undercoat on my little kooikerhundje makes hot summer temperatures especially difficult for him. House guests, too, joined the dog in a chorus of complaints, so I was soon outnumbered: either get central air for the house, or come up with some other solution. The tipping point for me came last summer. There were a few 100+ degree days to contend with, and it seemed to me that summers were trending toward longer, hotter, dryer stretches than ever before. Now you didn’t just have to outsmart the season for 2-3 weeks; you might have to cope with it a full 2-3 months. Washington was becoming the new California! So, even I had concluded by the end of summer 2009 that I wasn’t willing to maintain the status quo for next summer; something had to be done. Yet I still didn’t like the idea of air conditioning. It was additive, not preventative. Got a problem? Technology lets you solve it by purchasing something new, by adding on. I’ve lived long enough to be skeptical of that consumer mantra. Central air is not a trivial expense, running you $3,000 – $6,000 assuming your ductwork for heat even allows you to “piggyback” air conditioning into it. And despite the warming trends I mentioned earlier, this is Seattle after all, so there would be occasional mild summers that would leave you scratching your head as to why you invested so much in AC. Economics aside, air conditioning can be a frightening energy hog for anyone even mildly conscientious about conservation. Puget Sound Energy states that input wattage for electric central air conditioners can reach 6 kilowatts during operation. To put that in perspective, that’s about the power you’d consume running your stove and your clothes dryer—combined. Moreover, peering beyond one’s own fence line, you find that nearly 20 percent of the electricity consumption in the U.S. is attributable to cooling buildings. New air conditioning systems place a premium on energy efficiency, of course, with the requisite Energy Star rating system to help you identify manufacturers and models. But I still held to the notion that I might solve this heat problem of mine with prevention. I knew my roof was near the end of its useful life. When I moved into the home in 2001, the home inspector estimated I had about 5 years left in the roof, so I’d pushed that expectancy to just about double. With re-roofing inevitable, I began to investigate my options. I’d heard of “green roofs,” which deploy soil and vegetation to improve the cooling and insulation of a building, but I am sorry to admit that I balked at the “kookiness” factor: what would the neighbors think? But what about “cool roofs”? I’d recently read that Secretary Chu of the Department of Energy advocated them. This piqued my interest, but I had some concerns. Would it make my house look institutional? Would it cost too much? Would it really work? The majority of homes in my neighborhood are built in that classic 1950s suburban rambler style, with one-level and a low pitch to the roof. At one point I considered changing the roof structure to improve drainage with a higher pitch, but ultimately opted against this because of extra costs involved, as well as the desire to preserve the visual character of these kinds of homes. The two main roofing options for low-pitch roofs are torch-down, which is what my existing roof was made of, and PVC material, which is widely used for commercial roofs but is a relative newcomer in the residential market. As for traditional shingle-style roofing, roofers generally don’t even offer it for low pitches, as there is more exposure to damage from high wind. Visually, torch-down was definitely what I was used to. The advantages of simply replacing one torch-down with another included aesthetic comfort (knowing the look of the home would persist), and relative cheapness (it’s a tried-and-true roofing method that costs about two-thirds what newer materials and techniques cost). The reflectivity of a true cool roof, white and made of PVC, is far greater than what a torch-down can provide. Sure, you can get torch-down in light hues. Probably not pure white, but mine was a light gray. The problem had more to do with its tar base and rough, granulated surface (as opposed to the very smooth plastic surface of a PVC membrane). One roofer told me it was functioning more like an oven! Those 90+ degree days of summer would drive my thermostat to its maximum measurement of 88, so the old roof was providing no real relief. PVC is fully recyclable, while the torch-down is landfill bound. PVC roofing can carry a lifetime warranty (or 25 years if you sell the home), and you can reasonably expect your re-roofing job to be the last one you’ll ever do. By contrast, a torch-down roof will last you 15 years if you are lucky. Finally, torch-down requires an open flame during installation (it is, after all, called “torch” down). Accidental fires are rare with this method, but there is probably a reason that insurance rates are high for roofers offering the service, and only one of the four estimates I got on my job was based on that method. A single stray ember landing in the wrong place in your rafters can flare to life days later. Meanwhile, the PVC installation process does not require an open flame. Seek multiple bids on your re-roofing job, and allow yourself plenty of time to ask questions of each salesman. Some know a lot more than others, and their awareness of roofing as an environmental topic varies greatly. For example, one roofer objected to the notion that I might eventually like to add solar panels to my roof, while another dug right in and started suggesting optimal orientations and designs! 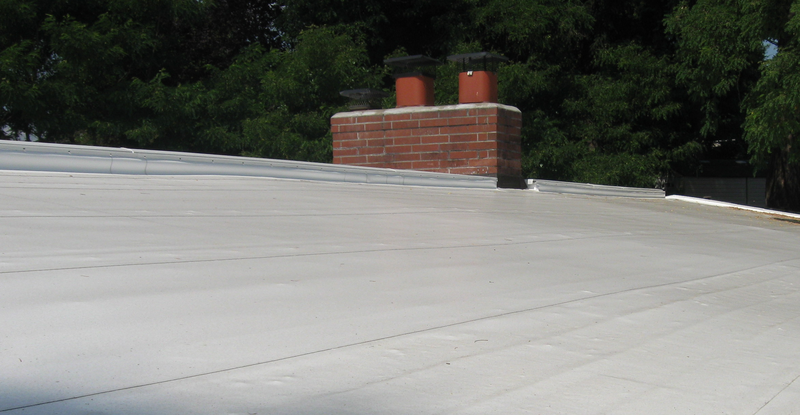 TPO is a similar roofing membrane type to PVC, and costs a little less. But it can become comparatively brittle over time, so prefer the suppler PVC membrane if you have the budget for it. PVC membranes come in different thicknesses, such as 40-millimeter, 60-mm, and 80-mm. As you might expect, the thicker the membrane, the more durable over time. I opted for 60, which the salesman conceded would still provide good durability for about $3000 less than covering my house in 80. Ask if the labor for your roofing job will be sub-contracted out. This one I found out the hard way, only after the fact. Fortunately, I was pleased with the work of the sub-contractor, but an ethical prime contractor should be straightforward about how the job will be done. Try to be on site during parts of the roofing job, especially the beginning. You can spot possible issues early that way. For example, I had to clarify to the crew that blowing in insulation was part of the work order, and that there was no access point to the attic from inside the house. Ask for any necessary forms and papers you will need to claim your federal energy bill tax credit for purchasing a cool roof. Mine included a “Manufacturers Certification” form and letter stating that my roof material meets or exceeds Energy Star program requirements. If your re-roofing job includes adding insulation to your attic, check with your utility company about any efficiency rebate programs they might have. Your roofing salesman probably won’t know about these, so you as the buyer must be proactive about them. Re-roofing provided me a great opportunity to add insulation to the attic; Puget Sound Energy sent me a rebate check that covered about a third of the expense. Conclusion: do the numbers add up? So, does installing a cool roof make sense from a financial point of view? Here’s how I’d crunch the numbers to compare my prevention-focused cooling solution with a more traditional “additive” solution like air conditioning. All numbers are approximated. Given that roof had to be replaced anyway, I spent about $7,000 over and above that to “upgrade” from the torch-down membrane to the PVC. But if I had gone with torch-down, remember that the house would have continued to bake in the summer sun, and I likely would have had to purchase central air. Note that window AC units would not work well for my home, as the most lived-in area of the house has floor-to-almost-ceiling windows that don’t open. So let’s pencil in central air installation to cost, conservatively, $4,000. That brings my surplus spending on the cool roof down to $3,000. The question of cost-effectiveness then becomes two-fold: how much electricity does my cool roof save me, given less reliance on running fans during the summer, and how much electricity would running the air conditioner cost me? For the former, it will be hard to assess until I have a few years of data in front of me, in the form of utility bills, to compare the “before” and “after” electricity consumption. But if that week in July is any gauge, it looks like the cool roof is making a real difference. For the latter, quite a number of variables come into play, including the efficiency of the air conditioning system, how many hours per day and days per year you run it, and how much electricity costs in your region. But it is certainly possible to spend hundreds of dollars per year on it. How many more years will I live in this house? Who knows? Life circumstances can change. Careers and families have a way of trumping mere buildings on a person’s list of priorities. If I am here 5 more years I will probably break even on the roof as an investment. Beyond that is gravy, profit, lagniappe. But here’s the kicker: even if it doesn’t pay off for me personally, if for some unforeseen reason I need to sell the home and move next year, this cool roof will pay off for the next owner, for the one after that, and for the environment as a whole. I’ve made a long-term commitment on behalf of one building to try to do the right thing.